It has never been easier to defeat Breed Specific Legislation. With dedication, thorough thinking, and cooperation you can be successful. In 2012 we saw a growing trend of repeals, rejections, and overturned BSL across the country. Recently in Iowa two communities were able to remove BSL from their towns. We wanted to find out more about these success stories, so we went straight to Stephanie Filer, Manager of Special Gifts & Partnerships for the Animal Rescue League of Iowa and Staff Liaison and Co-founder of the ARL Pit Crew to learn more. AFF: Can you start off by telling us a little bit about ARL and the ARL Pit Crew Club? SF: The Animal Rescue League of Iowa is located in Des Moines, IA and is our state’s largest animal welfare organization with an annual intake of over 18,000 animals and thousands of animals served through our community outreach programs. The ARL Pit Crew Club has really evolved over the years. To start with, Des Moines has a Breed Discriminating Ordinance restricting the ownership of “pit bull” dogs (dating back to the 1980s). This made it incredibly difficult to place “pit bull” dogs into homes and also created a community that felt like they had to be in hiding if they had a “pit bull” dog. So, with the blessing of our Board Chair and our Executive Director, the ARL Pit Crew Club was founded in August 2010 by myself and Camille Roth. The initial goal of the club was to take the three “breeds” that the city of Des Moines targeted in their ordinance and create a sense of pride for those who chose to love those dogs. Adopters received a free one year membership to the club at time of adoption and anyone could join with a paid membership (includes t-shirt!). Instead of using the city’s term of “pit bull” we coined the term “Lov-A-Bull” for any dog already in a home and “Adopt-A-Bull” for any dog still waiting. From there we launched an adoption campaign and a “Respons-I-Bull” campaign where we partnered with photographers to feature local dogs and their people. With an emphasis on responsible dog ownership and a desire to assist the public in being compliant with the ordinance, we also created a list of Pet-Friendly Housing, insurance agents who don’t discriminate, and businesses with special offers for Lov-A-Bulls. Since the Des Moines ordinance is confusing to navigate, we also created an ordinance cheat sheet for those who live in Des Moines and a list of dog-friendly cities in Iowa to help dog owners navigate the rules as they travel or look to move. 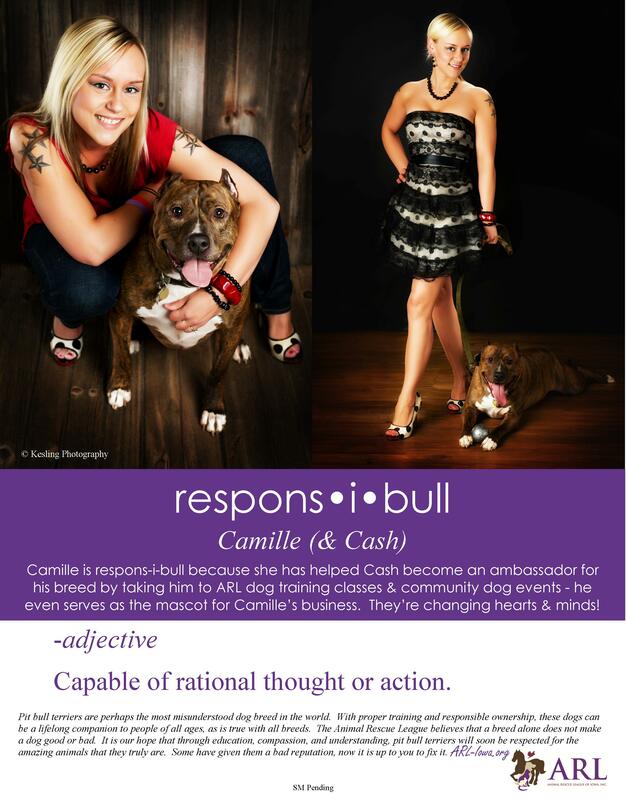 In 2011, we expanded our group from education and awareness from the ARL to action from the dog owners themselves. We started offering 50% off dog training classes for Lov-A-Bulls through our Train-A-Bull program and soon after started a campaign to get dogs Canine Good Citizen certified through our Award-A-Bull program – both thanks to grants from Animal Farm Foundation. We had our first two dogs receive their CGC in the 2011, but realized there was still a lot of confusion to the process, so in January 2012 as part of National Train Your Dog Month we launched a no-budget video series called “10 weeks to CGC“. We documented how to train your dog to prepare for the test using one technique each week. In 2012 we had eleven dogs receive their CGC award! Also in 2012, we created an elite group within the Pit Crew Club called the Ambass-A-Bulls because there was a desire within the group to do more and start to make real change in their communities. The Ambass-A-Bulls serve as the community outreach arm for the Pit Crew club. In order to participate in this group, dogs must have received their CGC award, be compliant with any ordinances in their city, and be spayed/neutered and microchipped. The Ambass-A-Bulls dogs and their people visit schools to talk to kids about bullying, stereotypes, and how to safely greet a dog of all breeds, visit nursing homes to provide animal-assisted therapy (for those who are therapy certified), visit schools to help kids improve their reading, participate in local parades and events for awareness, volunteer to work with the dogs in adoption, assist potential adopters with questions, work to change BSL, help dogs prepare for the CGC test, donate blood to the state’s canine blood bank, and much more! AFF: BSL was recently overturned in Perry, IA and rejected in Newton, IA. 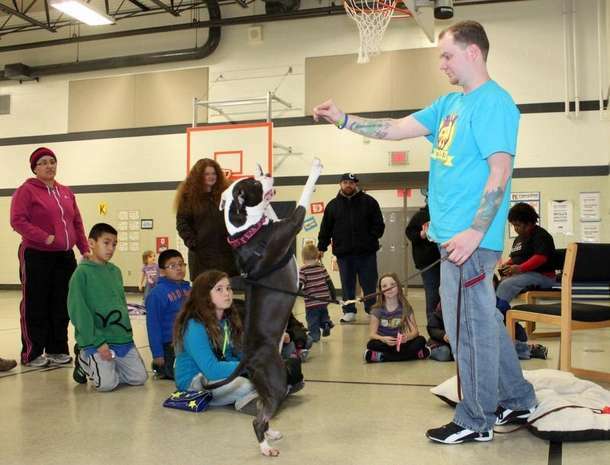 The ARL, along with other local advocates and organizations, like the Perry Humane Society, worked together to address BSL in these communities. Can you share your strategy for taking on this challenge? SF: All of the efforts above were done to help prepare us for our ultimate goal of creating breed-neutral communities. Our strategy has been to wait until we’re ready with our message and the people are ready to hear our message. At times this has been painfully long, but it has proven time and time again to work. Timing is everything. There has been a lot of behind the scenes work that has gone into each of the victories as well. With the Perry victory in the fall of 2012, we played more of a support role. Abby Benifiel, Director of the Perry Humane Society contacted us after she had laid all of the ground work with the city council and just needed us to help seal the deal. The city council was planning to meet to add additional breeds to their already existent BSL, so Abby saw that as an opportunity to remove all of the BSL! We worked with her to provide the fiscal impact research, dog bite statistics, and ownership discrimination information and, armed with all of the info and a great presentation, the city council removed all of their BSL instead of expanding it. To celebrate the victory, Abby coordinated a therapy dog visit with the Ambass-A-Bulls to one of the local nursing homes. 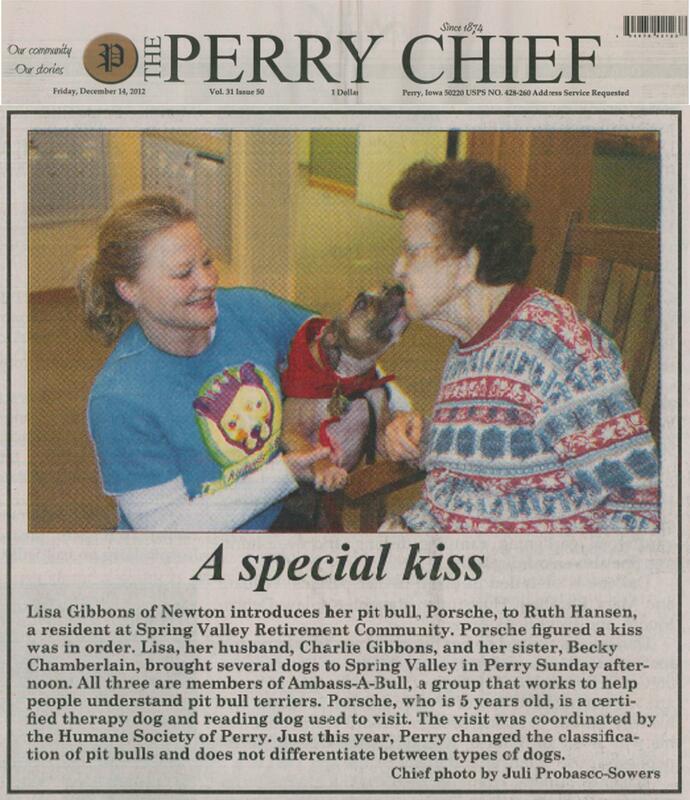 Nursing home visits with “pit bull” dogs are now a regular occurrence in Perry. “Thank you for the opportunity to speak in front of you tonight. My name is Lisa G. and I have been a business owner in Newton for 22 years. In lieu of recent events involving dogs, I feel the need to say that more needs to be done, not only to protect the citizens of Newton, but also the dogs that are owned by reckless and irresponsible people. Not only are people victims in these instances, the dogs also suffer as victims at the hands of their careless owners. As a responsible dog owner I too want to be protected from the reckless few who disregard the laws that govern responsible pet ownership. I’ve heard some trying to make this a breed issue, but it has nothing to do with breed – it is merely a dog issue and an issue surrounding the careless people who sometimes own dogs. Almost four years ago my husband and I were asked to foster a dog who needed a new home. Fostering quickly turned into adopting. We now own two dogs. Chloe is a 16 year old golden retriever/cocker spaniel mix and Porsche, who was initially our foster dog, is now a 6 year old “Pit bull”. You may have also heard about Porsche in the news, but it’s not because she has done anything wrong. Instead, Porsche is an AKC canine good citizen award earner, a therapy dog with Therapy Dogs International, a Tail Waggin’ tutor, (which is a child’s reading dog), and she and I are active volunteers in the community of Newton. 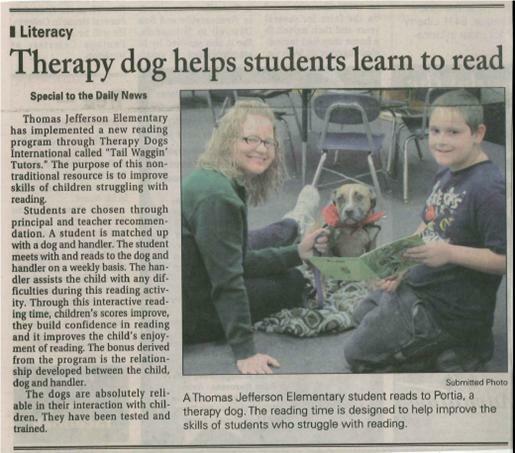 For the past few months every Monday morning she reads with children at Thomas Jefferson Elementary School who need extra help with their reading skills. She also volunteers every Wednesday afternoon at the Newton Public Library reading with children at an after school program. She visits many nursing homes bringing smiles to people’s faces…Porsche is not the exception to the rule, she is the majority. Just as I am not an exceptional dog owner, I am the majority. After much discussion, the council unanimously voted on a stronger, breed-neutral vicious dog ordinance. While this was a great first step, we will continue to work with the council and share other breed neutral best practices to strengthen their dog laws, including anti-tethering, at large penalties, spay/neuter, etc., in order to proactively create a safe community. AFF: What were some of the key elements to your approach? SF: As you can see, Lisa had a powerful message thanks to the groundwork the ARL Pit Crew and Ambass-A-Bulls had begun. First, create awareness. Then create positive action and rally the “troops” under a common goal and message. Finally execute the plan. For the cities that we’re currently working on, we begun attending the council meetings regularly and are getting to know our council people prior to ever bringing up the dog issue. In January alone the Ambass-A-Bulls spent a collective 32 hours attending or presenting at their council meetings. AFF: How are you putting AFF’s resources and tools to use in your advocacy work? SF: Over the past 2.5 year journey, we’ve learned a lot, but more importantly we learned how much we don’t know. So early on we made a conscious decision to model our language and strategy based on what we learned from Animal Farm Foundation. In Lisa’s presentation above, you’ll notice a lot of language from AFF included. If she would have stormed in there with her “pit bull” shirt and “blame the deed, not the breed” rhetoric, her message about all of the great things she is doing for the community would have been overlooked. This was one of the most powerful learning moments we experienced early on from AFF and it’s how we’ve differentiated ourselves from the other “pit bull” groups that have popped up over the years in our community. We firmly believe after everything we’ve learned from AFF that saying the wrong thing is worse than saying nothing at all. We’d rather say nothing until we’re ready to say the right thing. The “loud and proud” strategy just doesn’t work. When it comes to awareness, we routinely reference the “Labels & Language” section of the AFF website, watch the AFF BSL Presentation, and make “The Language of Advocacy” article required reading for our Ambass-A-Bulls. If we’re not all speaking the same, correct message, we’re going to confuse our audience. 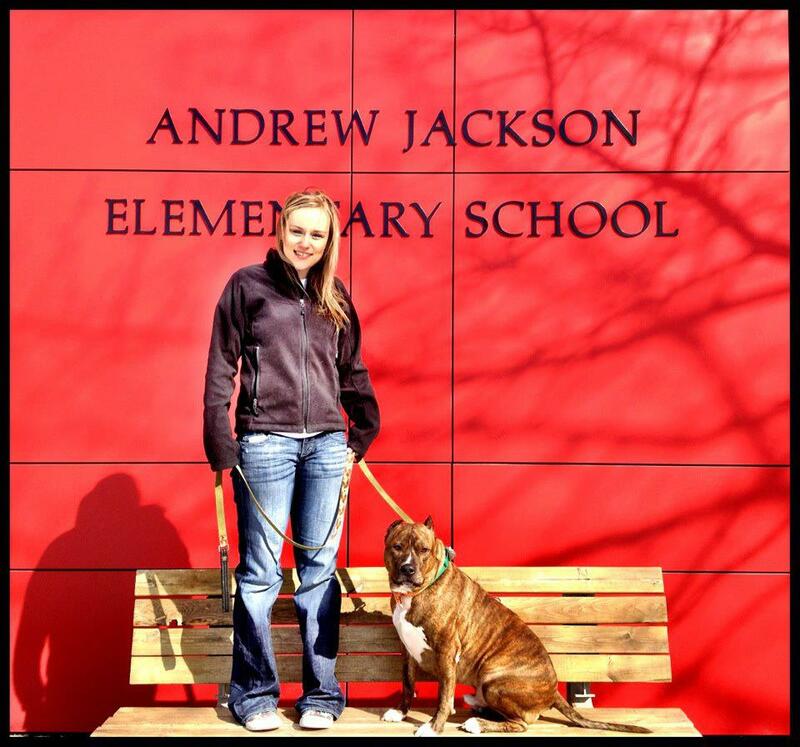 Thank you Stephanie and the ARL for sharing your successful approach to fighting BSL in Iowa. Keep up the inspiring work! 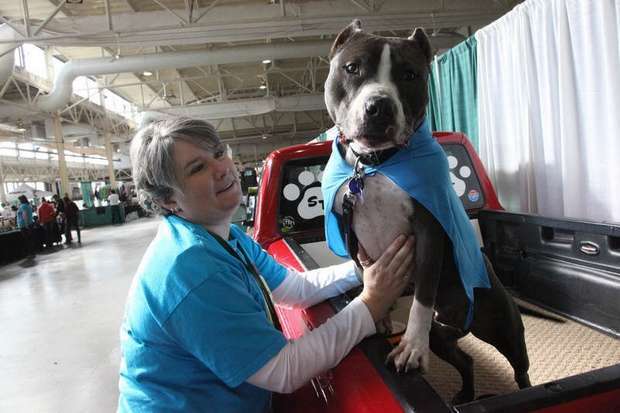 To learn more about the ARL Pit Crew, please visit them on Facebook. And for further BSL resources, please see our website. Previous BSL is Contagious. Speak Up Now. As we try to find temporary housing in Iowa, we we are hitting major roadblocks because our dog has Staffordshire traits and is deemed a “Vicious Animal”… It is sad that irresponsible dog owners have set a precedence for uneducated lawmakers. I hope that once we are there, we can help make a difference and help to end Breed Specific Legislation (BSL).